Capt. Darral Conklin was at the helm of the MAGGIE JOE when they ran over a monster marlin during a birthday cruise for angler Ron Foo. Foo and his friends Mark Tarone, Mike Koyle, Braden Edwards, Jay Bloom and Danny Epstein kept the pressure on the fish for the next 71/2 hours. 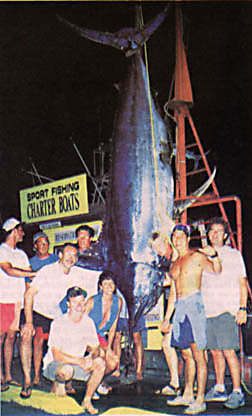 This was Kewalo Basins largest marlin since the COREENE-C's 1805-lb blue on 6/10/71.